I tend to think of upcycling as saving things from becoming landfill, upgrading their worth, making them whole and beautiful again, but it’s also upgrading things not destined for landfill. Hence this post in which I show you how to upgrade your builder-grade mirrors. Here’s the before picture. As you can see, I’ve already added an over-the-john cabinet purchased on sale at Canadian Tire, and a clock I snagged on Facebook Marketplace for $5. The walls are the lovely mist grey that I’ve used throughout the house, and the light fixtures are from Lowes–on sale of course. I googled “framing mirrors” and the internet did not disappoint. I decided I really liked this one instructional post, so I followed what they did to the letter. I couldn’t find locally the exact contractor adhesive they’d used, so I ordered it from Amazon. According to the manufacturer’s website, the great thing about it is that it’s “insta-grab” but you can move your piece around for an hour… Or at least that what it claimed. I visited several stores, including the ReStore and Home Depot, but Lowes had the best trim for framing. I found a sales associate who had done her own mirrors, so we carefully chose 7 pieces that were as straight as possible… mostly. I’d need 4 for the upstairs mirror and 2 for the power room, with an extra just in case. The wood was pre-primed, which was handy–no sanding, prepping or priming required. I procrastinated on starting because I hadn’t used my mitre saw for angled cuts before, but family-friend Hugh had shown me how to make straight cuts and I had an owner’s manual so… I began. Turned out the dimensions of the mirrors were exactly that of the wood: the mirror was 4 feet by 3 feet and the board was 7 feet. Perfect… except it wasn’t. Here’s a picture of the wood after I’d carefully measured, cut to size, and painted. If there were newbie mistakes to be made, I made ’em. Turns out one of the boards wasn’t quite straight, that the insta-grab adhesive didn’t instantly grab, that the mitre saw shifted a bit when the release tab was re-set, and that the boards weren’t exactly 7 feet. But I perservered. I’ll know all this for the next time, although I later decided I preferred my great-grandmother’s guilded mirror for the downstairs powder room and returned 5 pieces of unused wood. Lowes is great about returns. But my niece wants me to do her bathroom mirror too, so I’ll keep you posted. Here’s a shot of the work-in-progress. The couple in the instructional article said they just used painter’s tape to hold the pieces in place while they dried. Well, painter’s tape is not my friend. It didn’t hold (and this is the expensive Frog Tape everyone raves about on Upcyclers Anonymous). So I ended up putting up first the bottom piece. The bottom of the mirror stuck out about a 1/2 inch from the wall so I used office fold-back clips to hold it in place. Once it had dried overnight, it would support the 2 side pieces, then they’d support the top piece. Hmmm. Turns out one of the side pieces wasn’t straight. If I pushed the top against the wall, the bottom popped out. If I pushed the bottom… I ended up piling 2 heavy file boxes on the counter and using a lip balm to widge between the wall and the top of the frame to hold it in place. Guess I bought clamps for nothing. o.0. Here’s the finished product. It looks much better than before. You can barely notice that a little bit of the mirror peakiing out the top left corner. And hey, for once I used another colour than black. Thanks for reading. Next up… solar lighting. Or possibly, my new patio doors. Stay tuned to find out. Never before in my life have I ever waffled on something at a thrift store, then come back for it a week later only to find… it was still there. Huh. I should have figured that the other local upcyclers (with whom I’m hoping to connect at some point), had by-passed it because it was just too much work. But I tossed it in my shopping cart, presented my discount-with-donation card and left the Salvation Army with my proud find. For $8.00. I posted this picture to Facebook, where my 200 closest friends could admire it. The concensus was it hailed from the 1950s. Some previous upcycler had glued maps on it. I liked the maps, but they were ruined–torn, spilled nail polish… So I began to strip it off. Well… now I know why it was hadn’t been snatched up before I got there the second time. 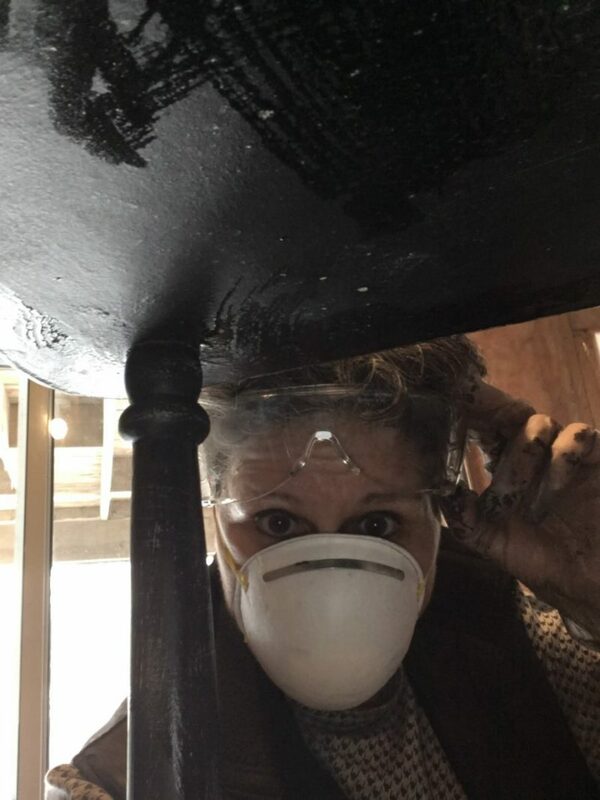 I tried various chemicals, starting with the least harsh and working up to serious stuff that required goggles, a mask (they said respirator), and thick work gloves. (See my new profile picture.) In between, I tried ironing it with parchment paper between the iron and the glue, as someone on Upcyclers Anonymous suggested. Now that was an interesting learning about parchment paper and glue. So much more than just baking. More on that another day. So I stripped and I scraped, a long, slow process taking weeks. Under the maps, I found more paint. Under that layer, I found someone had handpainted bright orange aster blooms on it. Under that was the white paint you can see in the shots, which was probably lead based and now I’m going to die. But not before I finish this blog post. I stopped stripping when I reached the white paint and just painted over it. The legs were wobbly and there was no way to get at any nails or screws, so I built up little supports where the legs met the lower drawer using very old wood filler that I’d gotten custody of in the divorce. It worked, but it’s less than lovely. Afterwards, I bought new wood filler that wasn’t 10 years past its expiry date. The inside of the drawers still had the original flocking which I wanted to keep, so I washed it with dish soap, let it dry and discovered in doing so, I’d caused one of the drawers to bow outwards, meaning it would no longer fit in its slot. So I re-wet it, affixed a large clamp in the middle, tightened and let dry. Voila! A little bar soap (will rub the sides with an unscented candle next time), and the drawers slid seamlessly home. Next I painted the drawer fronts white and the body black. Sadly, I had accidently damaged some of the veneer when scraping, making noticable dings and dents. The great thing about paint, is that you can repaint! So the top became black and the drawer fronts gold. I used a cheap gold paint from the dollar store, so it looks a little orangey, but still. Then I tried a stencil. I liked it, although it ran a bit. I wanted to save the antique drawer pulls for another project, so dove into my for-donation bin and retrieved the knobs from my re-painted kitchen cabinets. (Goodbye, golden oak). Got my friend Hugh to show me how to use my new drill*. (*See my first upcycler post “Girls Don’t Need Tools.”) And it worked! First I used red nail polish over the golden oak “button,” didn’t like it so repainted them with black nail polish. Everything got a coat of polycrillic to protect the paint. And the finished product now sits in by my front door where the light is dim enough to mask the imperfections. And I love it! Oh, no! My beautiful little footstool came apart. Whatever shall I do? Always the silver lining type, I’ll use the fact that the screws came out as an opportunity to recover it in better quality striped material. Same great look, lots less dog hair. Then I’ll use my brand new drill, which I finally learned how to use, to make a more secure fix for the hardware. Stay tuned to see how it all turns out… and the oft-times amusing steps along the way. Not to leave on a disastrous note, here are 2 trays and a trivet I painted this weekend. And remember my advice about always taking lots of pictures? Oops. But still… (Tangerine added for scale.) Notice there’s no bleed on the stencil this time. I think I’m getting the hang of it. Next up, the butler’s table. I’d acquired it in a garage sale years ago, and decided to paint it black, too. Surprise! Actually, the challenge there was figuring out how to brace the scissor-like legs in such a way that I could paint them, especially, the part right at the join. Weirdly, I found I had exactly the right amount and width of grosgrain ribbon and also? Exactly the right number of brass upholstery tacks–eight. No idea where either item came from, but there they were, among the things I’d moved from my old house. I didn’t get pictures of the top while work-in progress. Suffice it to say it went from ugly orange wood to beautiful black, too. Someone had cleverly figured out that to tack grosgrain ribbon on the top of the legs, then wind it around and tack it on the other side, would keep the table from collapsing. Except, the first one was easy, I had to manipulate the hell out of the scissor mechanism legs to first, remove the old tacks, then to hammer in the new ones. But the great thing about paint, is that you can easily cover any errant hammer whacks. And I did. And the final product… sits at the top of my stairs, conveniently where I drop anything that needs to go down. Today’s newbie lesson is—take pictures of everything! Pictures are important—not just so I can show off my “before and after,” but because in this case, once I finished painting and reupholstering the little bench, I couldn’t recall how the two pieces fit together. But let’s go back to the beginning, shall we? I brought it home and took it apart, failing to document how. It was old—I did battle with scores of staples that the previous recycler had used to cover it with a very light cotton—not upholstery fabric at all. Once that was off, I tackled the original cover, which was nailed on with rusty upholstery tacks. They were old, tiny and dug deep in the aging wood. How was I ever going to get them off? Once I had the original, gross fabric off, I discovered it had been stuffed with straw and a bit of horse hair which was tightly packed down from the hundreds of butts that had planted on the bench over the decades. Luckily, there was one nice day in December when I was able to take all the messy stuff outside to strip and sand. The ancient stuffing went a blowing in the wind and will no doubt be incorporated into various bird nests this spring. Although there was a lot of space to grab the bench, I had to grab it by one rusty tack. A quick call to my doctor, and I am reassured I’m not due for a tetanus booster till next year. Whew! The legs had been a bit rickety, but once I painted it, it seem stable enough. I dunno if paint in the joints is enough to keep it steady forever, but so far, so good. Next up, I would reupholster the bench. It consisted at this point, of a nice piece of wood the size of the top of the bench. And nothing else. Since I’d found recovering the little footstool fairly simple, I thought I’d do the same with the bench. Only this time, I wasn’t just covering over the original fabric and padding. I cut out the needed amount in the better striped fabric—polished cotton, formerly a high quality curtain obtained from Salvation Army for a couple of bucks and carefully picked apart into 2 pieces. I’d recovered my dining room chairs a while back, so I knew I needed foam. (Let’s have a moment of silence for the gone but not forgotten Designer Fabric store formerly on Queen Street.) I drove up the Fabricland in Newmarket. It turned out to be very expensive and they didn’t have any in stock anyway. I cast about for other solutions—seemed silly to put $40 worth of foam on an $8 bench, and I needed a solution going forward or I’d narrow my profit margin on anything I sold. I considered buying another piece of furniture and cannibalizing the foam. Value Village had some stadium cushions, but they weren’t cheap either. Then I noticed I had brought a large cushion with me to the new house. Weird, becaue it was for an outdoor chaise lounge that I no longer owned. It was sweat-stained and grimy. By rights (and Marie Kondo) I should have purged it. But now I’m glad I didn’t. “It must have foam inside,” I said to my dog, because it was still very puffy after years of use. So I cut it open—and found it was filled with nothing but batting. And I’d already bought batting (for $2 at SA). But I figured if it could fill the outdoor cushion, it could fill my bench. It was just for me, and I could always re-do it, right? So I stuffed and covered it, my trusty staple gun at the ready. Now I had two finished pieces: a painted body and a reupolstered bench seat, pictured below. The whole process had been slow, but steady. Sadly now, it ground to a halt. I couldn’t recall how the seat attached to the bench. There was no way to nail it in. Should I glue it on? I know that’s not how it was. But casting around my workshop, I remembered I had double-sided Velcro squares in my sewing kit. Since all the pressure would be downwards, it wouldn’t matter if it wasn’t the most secure way of connecting the two pieces. So that’s what I did. Velcro Sqaures, top and bottom. And here’s the final bench, sitting proudly in my front hall for timely boot removal. Allow me to say first off, that success is relative. I still need to learn a lot about paint and painting, but I’m delighted with my first “real” project: my little footstool. I love thrifting—more than painting. It’s like really cheap shopping. When I needed to outfit my new kitchen from scratch last fall, between loyalty points, sales, discounts, gifts and thrifting, I probably did it for a couple of hundred bucks. The new stainless steel appliances came later, but even they were Black Friday deals. But I digress. I arrived at the Newmarket Salvation Army one day in early January just as someone was donating a little stool. You know the one from the 80s that we all had. Came from Regal and fit the Toronto Star TV Magazineperfectly. It looked like this one, which is available today from Amazon for $77.29 Cdn dollars. The legs are slightly different, but it’s actually the identical faux tapestry. The one I snagged had already been recovered once, but when I peeled back the fading cotton, there was the original faux tapestry, just as I remembered. I took the whole thing apart, carefully saving the screws and hinges. I didn’t want to use the grey chalk paint I already had, so, after sanding and cleaning and priming (in white), I grabbed the can of Rustoleum outdoor paint. The instructions on the can said you could paint wood, so I did. Two or three coats. Note to readers: Rustoleum outdoor paint does not clean up with soap and water. First I tried to paint the tapestry white using fabric spray paint purchased from Michaels. Two spray cans later, it looked as if I’d left it outside in a mild snow fall. Hmmf. So I got out my trusty staple gun and recovered it in black and white striped fabric that I’d also grabbed at Salvation Army a while back. It’s not the same polished cotton curtain I’d be using later on the bench (spoiler alert), and indeed, I may take this little guy apart again and redo it with the better quality fabric—they’re both black and white stripes after all. But I thought the stretchy, T-shirt-y material would be easier to work with. Here’s s shot of the exciting new stripes draped with the thin cotton that had covered it when I bought it. I struggled to get the screws back in, having covered the predrilled holes with fabric. But, after first doing it backwards, I finally got them in. They were tiny and the wood cheap and old—that’s what’s holding me back from re-doing it with the better fabric. I’m afraid the wood might not withstand yet another change. I love how it looks—glossy black (pay no attention to the drips and brush strokes), with the black and white fabric. I sprayed it repeatedly with Scotchguard, and later with anti-static spray, but the other thing that’s not great about the stretchy cotton is that dog hair sticks to it like Velcro. Now… it sits by Command Central (that’s the chair where I can see both the TV and the bird feeder), proudly holding the now-too-big Toronto Star TV guide and the remote. (I wonder if remotes had even been invented when this wee footstool came off the assembly line.) And I couldn’t be more pleased. How did I get interested in upcycling you ask? Sure you did. I started watching those reno shows: Fixer-Upper, Masters of Flip, Leave it to Bryan, Holmes on Holmes, and several others. My faves these days are Save My Reno because they upcycle, and Good Bones because I just want to hang out with Karen. She’s so much fun. And? She upcycles. From there, the slippery slope led to Pinterest, and then various Facebook Groups. I love Upcyclers Anonymous, Paint it Beautiful, and several others. There appears to be a great divide between chalk paint and mineral paint, but that’s a tangent for another day. Since I have a “discount for life” at Canadian Tire, I usually start there. I had just moved into my new home in Aurora, Ontario, and hired a painter to paint the entire multi-pastel house in a rainbow of greys. (Not quite 50 Shades…). So at Canadian Tire, I bought black outdoor paint for my patio table, grey chalk paint and a can of protective topcoat. All by Rustoleum, because that was what they had. I had yet to hear of Annie Sloan, Dixie Bell and F.A.T. paints. Not to mention Fusion Mineral Paints. Hmmm. Not sure it’s a good idea to buy a specialty product at a general store, because the can must have been sitting there for years. The bottom had hardened into a lump that defied stirring. But the top looked okay, so I persisted. It was just practice for now, right? I grabbed a little Ikea shelf I’d had for years, a box that wine had come in, and five “heads” I’d snagged at a thrift store. Oh, and some carved dragons I’d bought on the beach in Bali in 2000. So I primed with white Bulls Eye primer and painted. It’s not as easy as it looks. Brush strokes and bleeding paint are my nemesis, but for these projects, it was good practice. I also experimented with Modge Podge, stencilling and stickers on these pieces. The stencilling worked best. I’ve yet to try transfers, because they’re not cheap. I’ve read that you can make your own by feeding wax paper into an ink jet printer. I see a jammed up ink jet printer in my future, so I’m holding off on that. First up, my little Ikea drawer system. My learning here is that I don’t like it when the rest of the piece isn’t nicely finished. However, I’d read that when you paint a drawer, it can often get just that tiniest bit too big for easy sliding. Next was the wine box. I practied my painting, and later, stencilling. I used a dollar store self-adhesive stencil and as you can see, it pulled off some of the paint. Note to self: use the protector coat first, then the stencil. Haven’t tried that yet. Will let you know how it goes. The next two projects actually worked out pretty well. First were the dragons. I’d bought them from a seller who walked the beach in Bali–a memorial trip I’d taken when my mother passed away. The seller told me they were stained with brown shoe polish. I can’t recall if I primed them and I don’t have a before picture, but I painted 2 coats of the grey chalk paint, then dry brushed on some of the Rustoleum black even though it is for outdoor furniture. Then dry brushed some dollar store gold acryllic paint. The inside of their mouths was done with dollar store red nail polish. I love how they turned out. They have place of pride on top of a beautiful antique cabinet purchased years ago at an auction in Toronto. Lastly, I painted the white styrophone heads grey. I wanted them to be vaguely reminiscent of Doctor Who’s Weeping Angels. Painting styrophone was a challenge because it kept chipping off. I finally found if I handled it very carefully, and then didn’t touch them till the protective coating had dried, that I could then dress them and display them. Now they sit atop my antique barrister’s bookcase. At first, I just sat the heads directly on the bookcase, but after posting a picture to Upcycler’s Anonymous, someone suggested I acquire candlesticks. A quick trip to Salvation Army and $12.00 (less senior’s discount) later, here we are. The first thing I did when I bought my new home in Aurora, Ontario and began to rebuild my life, was buy smoke detectors, carbon monoxide detectors and a fire extinguisher. The second thing, was shelves. Tons and tons of shelves. Despite having gone all KonMarie on my belongings, half of which went to my ex, I still filled a moving truck. One of the big suckers. I’m so lucky to have a “discount for life” at Canadian Tire (although in some cases, Home Depot was better priced). I bought heavy duty black plastic shelves, lots of chrome shelves on wheels, and was given some wooden Ikea shelves. And so, before I started to upcycle, I organized. I had some stuff from my husband, a lot of dollar-store stuff, and some other stuff I’d bought from Canadian Tire and Home Depot. And thus I began my upcycler life. I finished my first trial and error (mostly error) piece on January 13, a month ago today. Back then, girls were required to take Home Ec, while boys were shunted to Industrial Arts. No exceptions. Always the rebel, I was dying to learn how to fix stuff. My dad didn’t know how to change a light bulb and my mom used a hammer for everything. Needless to say my signature was the first on the list. Imagine my shock when I wasn’t one of the 15 girls chosen. I headed for the VP’s office, demanding to know why not. I’ll marry well. Huh. What do you even say to that? And I did. I married a man who knew how to do it all–hang drywall, fix plumbing, rewire a lamp, and refinish furniture. But he wasn’t interested in teaching me any of it. He preferred to work alone and I knew better than to touch his tools. When we split up last year, he was scrupulously fair in dividing up the tools (but not the power tools), making sure I got my equal share… of things I didn’t know how to use. So here I am. Five months later, totally enamoured of upcycling furniture–saving pieces from landfill and turning them into beauties. It’s all trial and error… more error than trial sometimes. I now own a drill and a power screwdriver. They were sold as a set–I don’t know which is which. No kidding. The instruction manuals? All assume that much basic knowledge. Me? I don’t know how to affix a drill bit. Or is it a screwdriver bit? But I’ll figure it out. From this… to that. It’s all from gargage sales and thrift stores, even the lovely striped fabric was a $3.00 curtain from Salvation Army. Stick with me for some entertaining adventures in upcycling. Because you know what? Girls do need tools! Have you ever screamed at Word because it just will not cooperate? Word is a writer’s best tool, best resource, best friend. Writing a book is hard enough without the added aggravation that unfamiliarity with Word can create. As a writer, you owe it to yourself to learn how to use all its features—without shouting. If your font changes unexpectedly, your pages break in weird places, your titles are wonky, then this course is for you. In Mastering Word for Fiction Writers, you’ll uncover the solution of Styles for consistent text, the speed and convenience of the Navigation Pane for reorganizing your scenes and clicking around your manuscript, and how to write a synopsis in just THREE steps. Do you want to improve your editing skills and work easily with editors?